Lucy was born with the ability to create and control fire. She longs to leave the human world for one filled with Earthshakers, Transporters, and Chameleons, to name a few. 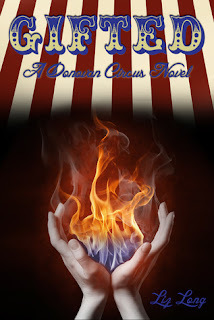 When she rejoins the circus, it's everything she hoped it could be--new friends, a potential love interest or two, and a place where she can be herself. When troupe members begin turning up dead, however, Lucy is suspected of foul play. She must not only prove her innocence but also realize the full extent of her power. To find the real murderer she must uncover the truth behind her father's fiery legacy while figuring out whom to trust within her new circle. Little does she know the history of the Donovan Circus and it's enemies might actually destroy the entire gifted world. WOW. WOW. WOW! I have never read a story about a circus before and I am so glad that Gifted was my first one. Any circus related story I read after this is going to have some high expectations to fill. This story was series amazing and I am so excited to continue on with this series. Liz Long is a seriously amazing author who can really get a person hooked on a story. There were so many times where I just didn't want to stop reading at all and had to keep going. This book right here is responsible for my new sleep schedule during my college holiday break, which consists of me not going to sleep until well past 7am, but I am absolutely thankful for it. Each character that Liz gave us the pleasure of meeting was very unique and interesting. They all each had their own particular personality that didn't falter once through out the story and each had their own amazing unique Gift to share with us. I had so much fun getting to know all of the characters and learn about their awesome abilities. The circus has always intrigued me, and now this story just makes me want to find out if those "circus freaks" are all real and not fakes. Once you got to the end of the story you really felt like you had created a new group of friends with these characters. You could really feel the family bonds that they all now shared. I loved the love interests that Lucy picked up along her journey and I really can't wait to see who she is with in book 2. And the whole story line was just fantastic! There wasn't a single thing about this novel that I did not like. It was utterly perfect. The entire time you just tried your hardest to try and figure out who the killer was and why they were doing it. It was such an amazing reading experience. I am at a loss for words for how much I absolutely adored this series. Im pretty sure I am at my limit of creative things to say, so to end I will just say that Liz, you did a fantastic job and I am 100% a fan and will continue to read this series to the end and will more than likely read anything else you ever write. Seriously people, you need to go out and get your hands on this story. One word... WOW! Gifted is an amazing story and I am so very extremely happy that I got the chance to read and review it. There is not a single thing I disliked about this book which makes any other circus related books I read in the future have some huge boots to fill. I was completely hooked to the story from page 1 and honestly didn't even think I was going to fall so in love with this series, but I did. Liz Long is an amazing writer and really has a gift. I will definitely be continuing with this series and will be looking out for more novels by her in the future. I squeed so loud I'm pretty sure my neighbors heard. THANK YOU so much for this amazing review. I am thrilled you loved it! !